In a previous blog post we have talked about Frankel the unbeaten horse that managed to take the limelight away from Black Caviar. We mentioned that he was to run one more race before retirement. Well at the weekend, this last race happened and of course he won. The event was the British Champions Day and a huge 32,500 people turned out for the event. Of course this was all down to Frankel. Those who are horse racing lovers and the newbies all faced a last minute rush for their ticket to see his last ever race. 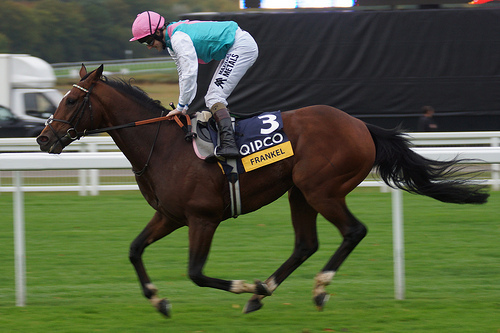 Even if you are not interested in horses or racing, I think everyone has heard of Frankel and what he is capable of. He hasn’t raced abroad which means his fans can be with him every step of the way and that is what they have done. Not having to race abroad also means a less complicated horsebox insurance policy too! The event itself was very heavily promoted but the huge success and turnout of spectators can definitely be attributed to Frankel fever. His rider, Tom Queally said, “No doubt he is better on better ground but his class showed. “I walked the track and was worried about conditions, but after walking the home straight I knew it was not too heavy for him to quicken up and go about his business and win.